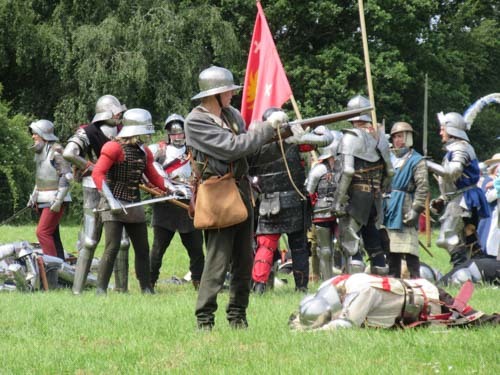 Such was the enthusiastic response to a real-life re-enactment of the Battle of Barnet that military re-enactors, organisers and visitors were unanimous in their hope that the first-ever Barnet Medieval Festival can become an annual event. 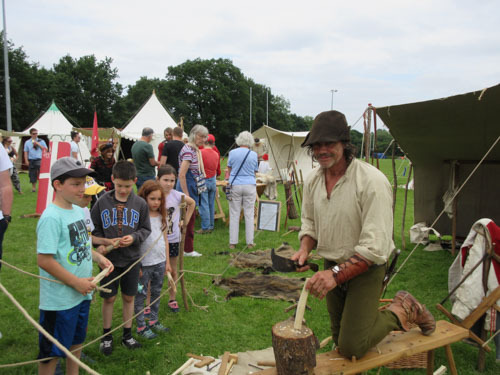 Almost 6,000 people attended the two-day festival which filled the Byng Road playing fields (June 9-10) with medieval tents and banners, displays of archery and cannon firing, and the recreation of scenes from both the Battle of St Albans (1461) and Battle of Barnet (1471). 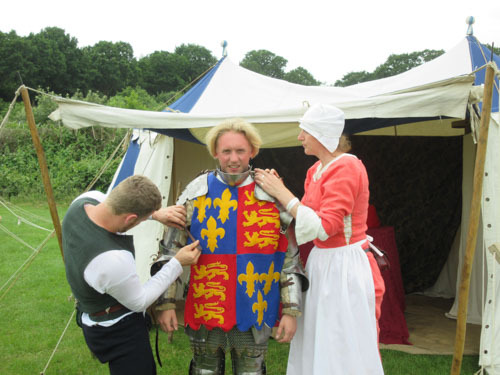 Over 150 re-enactors, many in full armour, kept a ten-deep crowd of visitors enthralled as the Lancastrians and Yorkists fought for supremacy – a battle that ended with the death at Barnet of the powerful Earl of Warwick, the Kingmaker. The festival, supported by the Heritage Lottery Fund, was organised by the Battle of Barnet Project, which is sponsoring an archaeological dig on the battlefield site – thought to have been in fields around Kitts End Lane – and is hoping to gain wider recognition for Barnet’s historic role in the Wars of the Roses. Well over 2,000 attended Saturday’s re-enactments, and with a second day of fine weather, attendance on Sunday was well in excess of 3,000. Members of the Medieval Siege Society and the Wars of Roses Federation were so pleased with the support that they pledged to return to Barnet next year if another festival is organised. 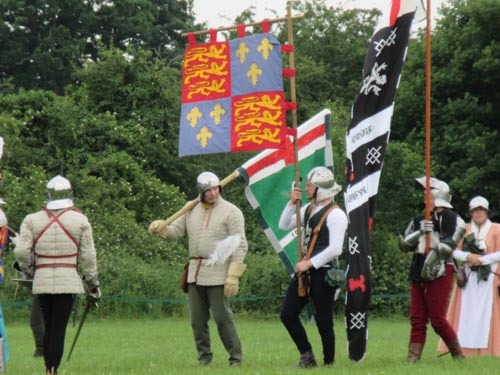 This was the first re-enactment of the Battle of Barnet since 1998 and the project – established by Barnet Museum, Battlefields Trust and Barnet Society – is hoping to create an annual event like the Tewkesbury Festival, now its 23rd year of celebrating the Battle of Tewkesbury, which was held on 4 May 1471, less than a month after Barnet (14 April 1471). Two medieval musicians from the Trouvere band greeted the Deputy Lord Lieutenant for Barnet, Martin RussellHoward Giles, the festival co-ordinator, said the turn out far exceeded his expectations and the re-enactors had been thrilled to find so many children among the crowds, eager to learn more about a battle that had been so decisive in the conflict between King Edward IV and King Henry VI. Mr Giles, who has 40 years’ experience organising historical and commemorative events, said the Byng Road playing fields were an excellent site for a re-enactment with rising ground, which was just right for archers and cannon firing, plenty of room for men in armour to engage in combat, and all in an area surrounded by ancient mature trees that recreated a medieval environment. 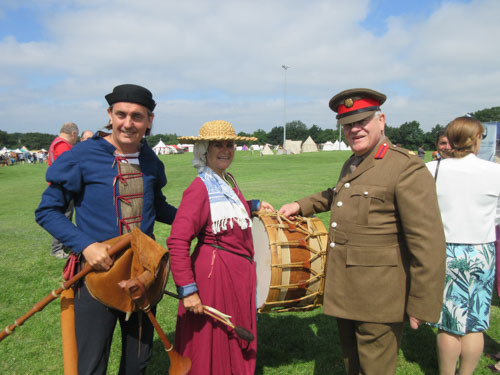 Howard Simmons of the Battlefields Trust said the re-enactors were delighted to have had such a great response. He urged Barnet Council to take the lead in helping raise awareness of what is the only registered battlefield site in Greater London. “This is an excellent site for a medieval battle re-enactment, a natural setting that has no intrusion of modern buildings, just trees and hedgerows. 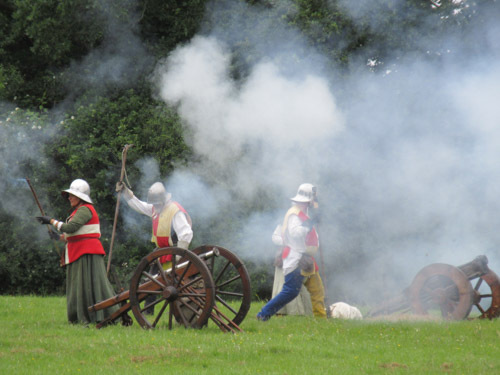 At the official opening of the festival – marked by the firing of a medieval cannon – the Deputy Lord Lieutenant for Barnet, Martin Russell, praised the organisers for arranging a celebration to mark one of the most decisive battles in the Wars of the Roses. Councillor Caroline Stock, the Deputy Mayor of Barnet, added her congratulations and said she too hoped that the festival would continue and could expand in future years – a hope that was endorsed on the second day of the festival by the Mayor of Barnet, Councillor Reuben Thompstone, who promised to use his mayoral year to do all he could to promote Barnet’s historic role in the Wars of the Roses. 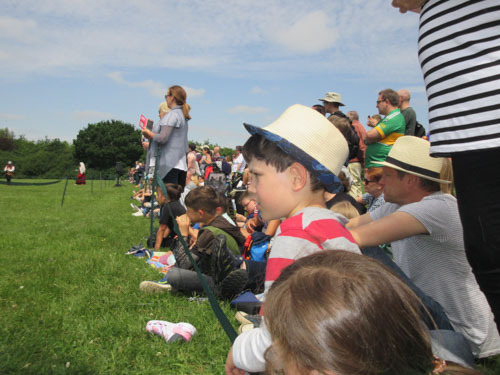 Mike Noronha, Barnet Museum trustee, said the project team was overjoyed by the “fantastic” turnout and the sight of thousands of local people enjoying the festival. The re-enactment was a return visit to Barnet for Gordon Hayward, of Redhill who is a long-standing member of the Medieval Siege Society, and who took part in the last-full scale Battle of Barnet re-enactment 20 years ago. 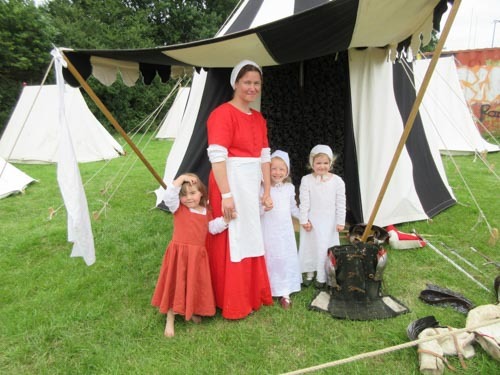 Gordon’s wife Joanne – who was dressed as a camp follower in the Lancastrian House of Bayard – said she met her husband through medieval re-enactments. 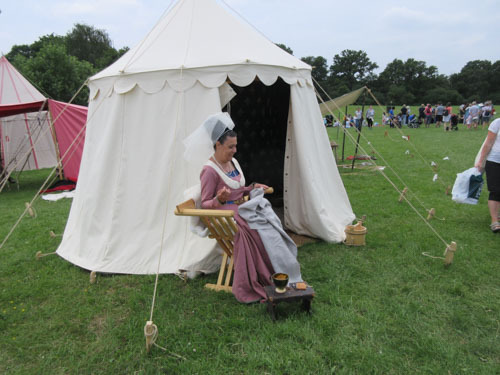 Another crowd-puller was Marion Oakley, from Ashford in Kent, dressed as Lady May Fitzallan, a Yorkist, who was sitting outside her tent making shirts for the poor. “Charitable work was something that occupied noble ladies and I’m keen to show that medieval life wasn’t all about fighting battles.